Mark Driscoll. Did Jesus make mistakes? Mark Driscoll: Did Jesus make mistakes? 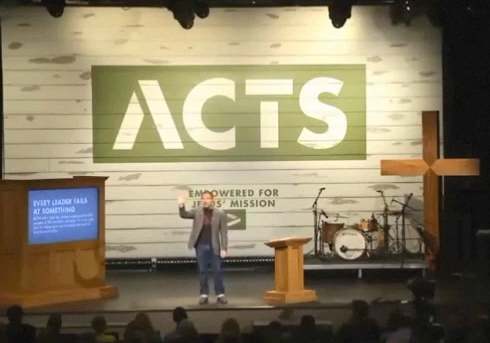 On May 4 2014, Pastor Mark Driscoll preached on Acts 6:1-71 and was at pains to draw a distinction between sins that we commit and mistakes that we make. During the sermon he raised the impertinent question ‘Is it possible that He [Jesus] made some mistakes?’ Driscoll accepted that our Lord Jesus never sinned, but wanted his congregation to consider whether Jesus, as He grew up, ever made mistakes, the kind of mistakes all children make. In typical Driscoll fashion, he asked, when Jesus was learning to ride a bicycle, whether He needed training wheels like other children, or did He never wobble? A feature of Driscoll’s false ministry is that he does not take the Gospel seriously. He is mischievous, as in the example he chose of Jesus riding his bike, and the example of Jesus playing Little League baseball. Joking about holy things is wholly profane. It is the world’s antidote to sober mindedness. Driscoll thinks the Bible is a funny book. He has no respect for it. The Bible says nothing about Jesus making mistakes. Rather, it tells us of the supremacy of Jesus Christ, God’s Son, who ‘is the radiance of God’s glory and the exact representation of his being, sustaining all things by his powerful word’ (Hebrews 1.3). Jesus Christ is the creator of all things. ‘He is the image of the invisible God, the firstborn of all creation. For by him all things were created, in heaven and on earth, visible and invisible, whether thrones or dominions or rulers or authorities—all things were created through him and for him. And he is before all things, and in him all things hold together (Colossians 1.15-17). The Bible contains all we need to know about God, and all we need for Christian living; anything extra, every imagination of the thoughts of carnal man’s heart is only evil continually (Gen 6:5). It is not for sinful man to question God. ‘But who are you, a human being, to talk back to God?’ (Romans 9.20). Moreover, the Bible tells us to avoid foolish questions (Titus). Driscoll’s foolish questioning of Christ, reveals only his own spiritual darkness. Since we know that God has given us all things that pertain unto life and godliness, let us not question God’s word as Satan tempted Adam and Eve to do. Let us not be so vain as to create by our evil imaginings a watered down doctrine of sin. Like the Sadducees, Driscoll is wrong because he knows not the Scriptures neither the power of God. Alex Murashko, Christian Post. http://www.christianpost.com/news/tyndale-house-publishers-defend-mark-driscoll-seattle-based-megachurch-pastor-apologizes-for-mistakes-111106/.